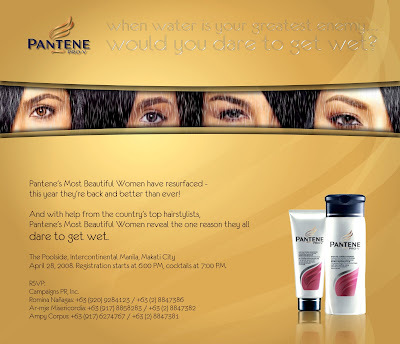 manila fashion observer: Pantene's Most Beautiful Women Dare To Get Wet! Pantene's Most Beautiful Women Dare To Get Wet! Oohhh! How intriguing huh? But it's not what you think! Again, I sent my Manila-based "correspondents" to do the reporting for me! After cocktails at Hotel Intercon's poolside with the strummings of a harpist on the foreground, they were treated to a visual spectacle of synchronized swimmers/dancers who aptly dared to get wet! Turns out it was the launch of Pantene Pro-V Hair Fall Control's new formulation - the water-activated Pro-Vitamin B5 formula that reduces hair fall due to hair breakage by up to 98%. It nourishes the hair root and helps strengthen hair resulting in less breakage. How relevant is this water-activated thingamajig you might ask? Well, if you remember, hair is at its weakest when wet. Remember how much hair falls out when brushing wet hair? And why detangling is such a big deal? And! The reason why swimmers are more prone to falling hair, split ends, discoloration and such? I should know, when I was in high school, I was with the swim club (can you believe that!) and I used to get teased "Badjao" (Sea Gypsy) because my hair was so brownish red from all the sun, water and chlorine I was exposed to! And, sigh, yes I always seemed to shed hundreds of strands of hair after showering! So swimmers especially, take note! This might just be the shampoo for you! Oh diba, showbiz! The guests even had the chance to interview the stylists and endorsers (ala The Buzz?). And do a meet and greet afterwards. You know, take photos with them for posterity...which my "correspondents" did not seem to do! Hehehe! 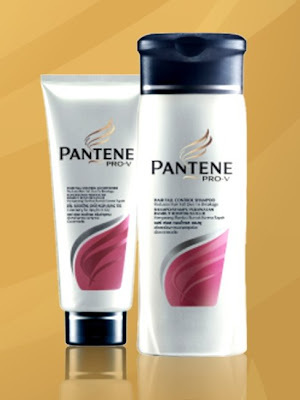 For more about Pantene products and Pantene's Most Beautiful campaign, check out their website!